Even though the latest Android L developed by Google has not been launched yet, it is definitely creating a lot of buzz in the mobile market. L's official release could happen along with launch of Google Nexus 6 phone later this year. People are anxious to know features about the Android L operating system (after the news about its Material design as well as lock screen notifications) and what the key advantages are. Now, for most of you who have installed the Android mobile operating system, you would be eager to have the Android L launcher on Kitkat here too. How do you install it though on the Google Nexus 5 or how do you get Android L on Nexus devices or Kitkat devices? Here's a simple rooting tutorial for Nexus 5 that should make it extremely easy. Now, before we enter into the details about the Android L installation process, there are a few prerequisites that have to be met. The device must be rooted for 4.4 or higher i.e. have an Android rooted device for Kitkat version or higher. The next thing you do is enabling unknown sources on your Nexus 5. This is an absolute must before the next steps. Install Xposed Framework and this will help you put on a few added modules. 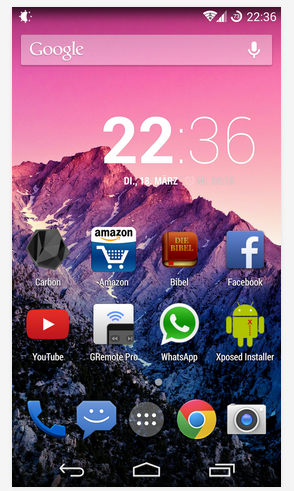 There is a stock home screen application called Google Now Launcher. This is present on the stock version of the Nexus 5. 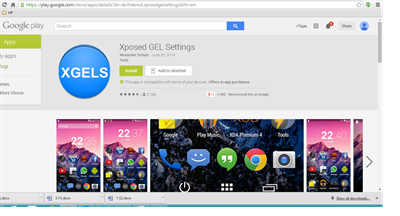 The first thing you need to do is install Xposed GEL settings; this is a free download on the Google Play store. You can search for Xposed GEL settings to have it installed. Once this is done, you will be notified from Xposed and that the module that is present in the application has to be activated. The moment you tap the 'activate' and the 'reboot' button, you would have Xposed helping with the installation. To configure XGELS, you have to wait till the phone finishes rebooting. Go to the GEL settings from your app drawer and you have to swipe in from the left of the screen to see the side navigations menus. You would find the L launcher design here; this is what you need to turn on. Once you toggle this, would get a message from XGLS about the module being activated and that you can restart the launcher automatically. Once the launcher is activated, you can have the changes complete on the OS. To avoid repeated notifications on this, click on the 'Don't show again'. Once this is done, you would be able to see the designs present on the home screen of the Nexus 5. The app drawer button would have a redesigned look and the folders icons would be different too. All you have to do from here is hold a long press on an empty spot on the homes screen and you should get the settings menu. All the animations would be updated and you would be on the Android L launcher on your Nexus 5. Apart from this, many users want to keep the Kitkat theme with Android L features. After you start the launcher, you would be asked for superuser permissions, this will take you to the options to choose the required theme and simple ticks would complete your theme here. After this click on the 'activate' and 'reboot' button like before to make the changes effective. Once you are back on, you would feel the new Android L interface (though it is still adapted heavily from the L). You would see the difference in the calculator, and the settings tab that is present. It would be plenty as there are many UI changes in the Kitkat and the new android, there are plenty of minor changes that just get missed by the eye. The Android L settings menu gets simulated pretty well through this theme app. The verdict is that L is a brilliant launcher to have on your phone and with the simple step instructions present, it should be very easy to install on your Nexus 5. Even people with other Kitkat devices can follow similar process to upgrade to L.
Read How to get Android L features with latest Nova Launcher?